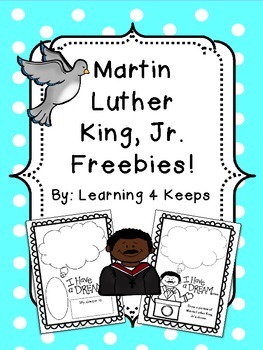 A Collection Of MLK Jr Freebies That I Found! I'm sure many of my fellow bloggers feel this same sentiment - how can I use other SLPs/Teachers resources when I'm promoting my own? I definitely struggled with using other people's packets in the beginning. It felt like getting all the ingredients for dinner and then going out to eat. Soon I discovered there really isn't guilt in supporting/using other bloggers items. It's nice to support the network of SLPs and Teachers on TpT, as well as contribute to the pot! So, on that ever preachy speechy point - here are the items from TpT that I will be using this week. Here's my disclaimer: all of these were free. Not all of these are SLPs (but our lovely teachers do good work too!). I will not be using all of these as they are intended to be used. I will printing out Lindsay Messner's (teacher's bits and bobs) vocabulary cards. There are only 5 cards, but I will be using them with my Kindergarteners so it's perfect for what I need it for. You can find these cards here. I'm going to be making a flap book with all 3 grades (kindergarten, 1st, and 2nd). I'm going to be having the Kinders draw and orally tell me the answers, while the second graders will utilize the prompts for writing. 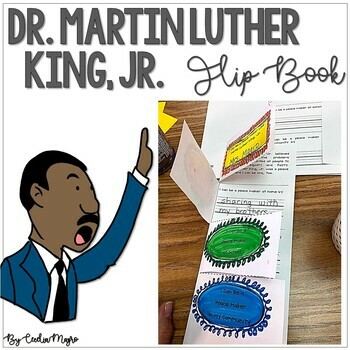 I'm going to be using the flap book print out from Cecilia Magro (I love first grade) that I found on TpT. I like that she provides 2 pages for the flap book, making it easy to modify. 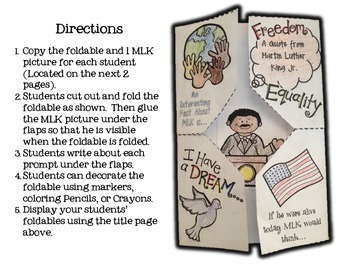 I also am really loving the flap book from Classroom Creations by Melissa. I'm definitely going to have to be doing the cutting for the kiddos, but they will enjoy coloring it. I am going to integrate the higher level vocabulary for my older kiddos if I end up using it with them as well! You can download this craft here. I'm working on recall and retell with my firsties, so I'm thinking of saving this timeline for them. I picked the brain of our awesome librarian, and she gave me a few books to choose from for MLK history. 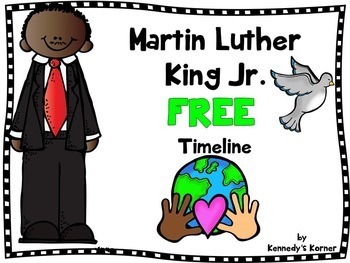 After we find out a bit more about our buddy MLK, I'm going to use this timeline packet from Kennedy's Korner and have them sequence and retell the life of MLK. You can download this packet here. 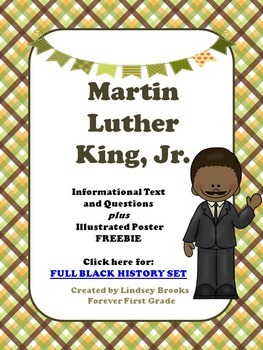 Forever First Grade has a nice packet for informational text. She provides the excerpt and questions that give the students two choices for fill-ins. It's targeted towards first grade, but I may end of using this with some of my second graders as well! I also really like the class packet from Learning 4 Keeps. I like that she has them connect what their dream is, as well as what MLK's dream was. It looks like it's meant for the kids to draw, but I might put some lines in and have some of my kiddos write as well if we have time. You can download the class packet here.